If there’s one thing we know about at TechCrunch, it’s that doing PR is hard for startups. We get our fair share of bad pitches to our general tips line every day, and we get lots of pitches sent to us individually that just aren’t a good fit. We always tell startups to figure out who the best writer for a given topic is, but if you have to do that across multiple publications (assuming you don’t want to give us the exclusive), it quickly becomes a chore. JustReachOut, a new startup out of growth hacking consultancy firm Criminally Prolific, recently launched a service that makes PR easier and more affordable for startups by combining its web services with some basic consultancy services. Last week, pressfarm made a bit of a splash when it launched a service that offers PR firms access to the emails of writers at major tech publications for $9 a month. If you just want to get in touch with us, you can just as well use our list here and save yourself a few bucks. Having an email is just one part of the process, though. How do you know what somebody covers? That’s where JustReachOut comes in. It takes this idea, but refines it and adds some basic consulting services on top. The idea behind the service is that most startups can probably bypass the regular PR channels in their early days by simply building relationships with the reporters that cover their fields. So the first thing you do on JustReachOut — after you watch a mandatory video on the basics of startup PR — is look for reporters who have written articles about topics related to your startup (think AWS, Drones, Facebook, mobile games, etc.). The service will then look for those and come back with a list of recent articles about the topic and the names of their writers. From there, you click on the writer’s name and you are taken to an email form that’s already pre-filled with a standard pitch. You could run with that, but the company really discourages you from it because you can also ping JustReachOut and they will work with you to craft a much better pitch (and I recommend you do that, because you really want to personalize these kinds of emails as much as you can). Dmitry Dragilev, who heads Criminally Prolific, has done PR for a good seven years now — and has regularly pitched us successfully during those years. (He got us to write about this, after all, so he must know something about how this process works.) As he stressed when I talked to him earlier this week, the focus of the product really isn’t so much on just getting email addresses, but on getting on the phone with him to learn more about how to do startup PR right. 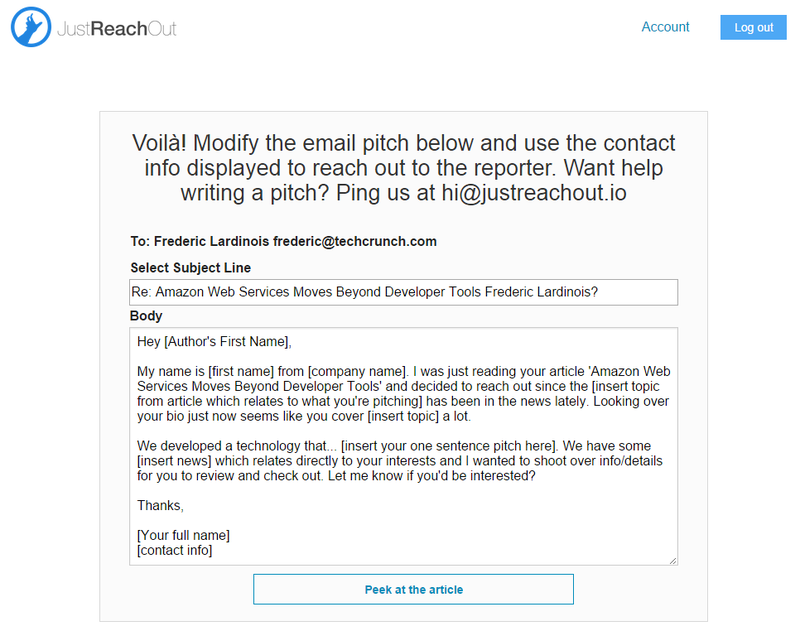 “While the tool shows you an email draft and email address right after you click ‘reach out,’ I can guide you through writing up your email pitch,” Dragilev noted. “I’m doing this to help startups think about how to build relationships with press over something they really care about.” The last thing he wants is for people to use the tool and then spam writers (which is much appreciated). Dragilev tells me that the tool enforces some limits on how many emails you can send to ensure that startups aren’t pushing stories too hard and to too many writers. The service uses Sell Hack in the backend to find its email addresses. That fails every now and then, but the tool will always let you know when it can’t verify an addresses. JustReachOut is currently available for $25/month, but after the summer that price will go up to $99 per month (if you sign up before that, you will stay at $25/month). Given that this comes with some hands-on consulting, that feels like a very fair price — especially compared to what a full-service PR firm would charge.